Living in a dorm hall can be somewhat interesting at times. From the many people that come in and out to fire alarms going off about every other week. With 150 students that live in Joy and Janssen halls, you have to wonder who is in charge of all of them. Well, that honor is bestowed on Mikey Ward. 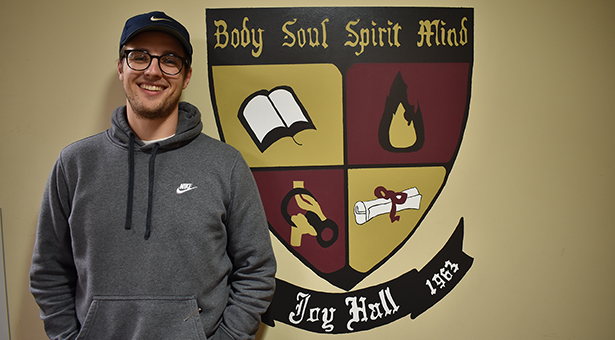 Ward, who is a GU Alum, is currently the CRE for both Joy and Janssen halls. In order to get the feel of what its like to be a CRE, I had Mikey answer a few questions. Mikey in his Joy Hall office. Photo by Ashley Chaney. 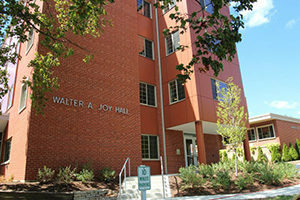 Joy Hall. Source: Greenville University Website. Ward said that Greenville is a special place and that he remembers his core trip his freshman year and his memories of being on the football team. 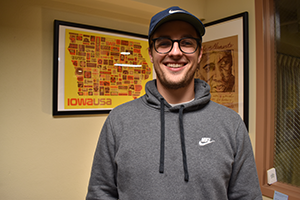 He’s gained many mentors throughout his years and says that he hopes to have a significant impact in peoples life like Rick McPeak and John Brittingham had on his life. Ward wants to touch everyone’s lives that he comes into contact with. Knowing Ward personally, I can say that he as a person wants to help you out and get to know you a little bit better. Like all CREs, they are here to help you no matter what. Next time you have the chance, sit and talk to your CRE because you might just find out how special of a person they really are. Listen to our additional questions with Mikey below!